AMMA Private Equity is a boutique Private Equity and Venture Capital firm that focuses exclusively on raising capital for start-up companies in the emerging tech sector. Venture capital, commonly referred to as VC, is a specific type of private equity where firms or funds focus exclusively on financing early-stage, emerging businesses that are deemed to have high growth potential, or which have already demonstrated high growth ie. number of employees, annual revenue, or both. Venture Capital as an alternative investment class is widely understood and accepted as the norm within the United States, where tech companies are dominating stock market growth. Largely funded by VC raisings, the tech sector is experiencing an unprecedented stronghold within the economy. In Australia, during the year to June 2015, VC funds raised $368M which, according to the Australian Private Equity and Venture Capital Association, was a record amount compared to previous years. VC has slowly gained momentum in recent years within Australia and in 2016 is expected to raise over $900M AUD — good news considering it is nearly triple the growth of last year. However, Australia has a lot of catching up to do when compared to other nations including Canada, Russia, UK, France, China, India and more. Despite the Australian economy being the strongest in the Oceania region, even smaller economies like New Zealand raise more Venture Capital. According to this Report, over $58.8B USD was raised and invested via Venture Capital across the US in 2015. In contrast, the amount raised in Australia is staggeringly disproportionately low. 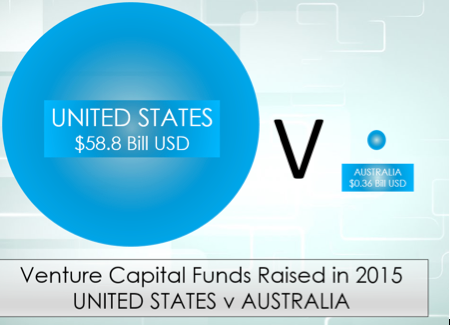 Compared to the USA, Australia invests 6 times less Venture Capital in relation to their GDP, indicating that Australia is nowhere close to saturation regarding potential for capital allocation for start-ups or investment projects. One of the factors thought to have contributed to Australia’s lag in expansion of Venture Capital investments has been our almost one-eyed focus on the mining and resources sector for many years. During this period within Australia, a financial phenomenon occurred that covered some of the need for Venture Capital as a form of finance. This was the practice of listing Mining Exploration Companies on the ASX to fund what would be considered the equivalent of a Mining start-up company. These days, Venture Capital is almost synonymous with technology, Fintech and internet start-up companies, where most VC capital is injected in the United States. AMMA Private Equity strongly believes the growth in venture capital investment can benefit investors and provide the serious push we need to grow the Australian economy. The Turnbull Government is aware that the tech space is where a renewed focus needs to be placed in order to buoy up our economy and create jobs for the future. Their response to this clear need can be found in their NISA (National Innovation and Science Agenda), launched earlier this year. This forward thinking agenda has resulted in $1B AUD being committed to funding new innovations in tech and the sciences, and offers significant tax breaks and incentives to those who invest in start-up innovations within this sector. The launch of the NISA is an exciting development for both entrepreneurs and Australian investors who previously did not have many options or access to Venture Capital investment. Meanwhile Venture Capital continues to soar in the US with companies such as Sequoia Capital, Goldman Sachs, Benchmark Capital and others continuing to inject massive funding into new companies with great potential. Interestingly, while the US continues to be the largest recipient of VC investment, China and India, the largest emerging markets for Venture Capital, are slowly catching up. These two markets combined have doubled their share of the global market in just a few years and now account for a quarter of the entire venture-capital market. In Europe, Germany has for the first time surpassed the United Kingdom, signalling a growing start-up culture in cities such as Berlin. Banks are notoriously conservative as to where they invest their funds, so Venture Capital is often considered a more appropriate source of finance to help grow less traditional, possibly ‘high risk, high return’ businesses. AMMA Private Equity is one of the only companies in Australia that not only focuses on promising tech start-up companies but is also considered a true Venture Capitalist. It is this focus and willingness to embrace an untapped market that could deliver great rewards at the end of the journey. AMMA Private Equity is a boutique private equity company based in Australia. They exclusively connect tech start-up businesses with an extensive Accountant network in order to raise capital. *Please note that nothing in this article should be construed as constituting financial advice. Professional advice (legal, financial, industry or any other relevant professional advice whatsoever) should be obtained before applying, using, adopting or relying upon the information or content contained in this article. The information or content is not intended to be nor should it be relied upon as a substitute for legal or other professional advice. Please seek professional advice before acting or relying on any of the content. AMMA Private Equity is a boutique private equity company based in Australia.